Nina Burri was born in Bern-Switzerland and started her Dance –and Ballet Education as a 6 year old at the local Musical School of Edith Langer-Tolnay. From the age of 10, Nina performed in many Fairy Tale-Musicals and dance shows with the School’s Musical Company, including ballet, acting, singing, jazz- and moderndance, and tap. But after that her career brought her to the Moulin Rouge in Paris, to the vanguard choreographer Maurice Béjard in Lausanne, to Israel, Peking and many other exotic locations worldwide. After further studies at the International Arts School in Beijing/China, the beautiful artist, born in Berne / Switzerland is now fascinating us with snake like movements, paired with a bewitching gracefulness. 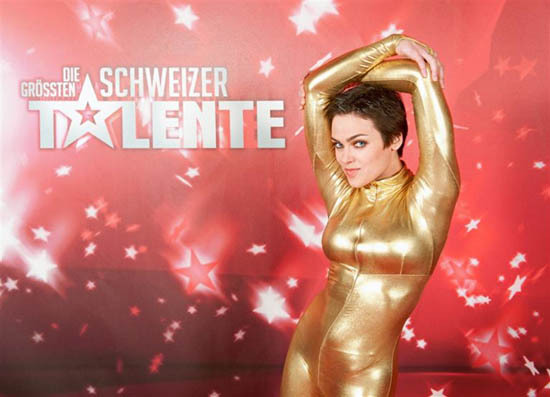 After her big success in the show: “Greatest Swiss Talents”, she is performing all over the world from Zurich to Las Vegas!